Special interests' and spinmeisters' (overlords) efforts to surreptitiously capture our legislatures has stalled in a standoff at the United States Supreme Court. Our "representative democracy" has retrogressed to a form of feudalism where the overlords convey a fiefdom (safe-seat) to their congressional vassal in exchange for that vassal's allegiance2. What is the voters' roll in such a retrogressive feudalism, beyond revolt? Today, the court has stayed the Wisconsin gerrymandering1 case of the Western District of Wisconsin, case No. 3:15-cv-00421 while it hears the questions presented by Gill, Beverly R et al. v. Whitford, William et al. (16-1161). Get media background about the case at Fair Elections Project Newsroom and Loyola, Litigation in the 2010 cycle for status of redistricting lawsuits. "We provide equal justice under the law...by 'upsetting settled expectations'"
It is difficult to imagine a Supreme Court case that does not "upset settled expectations"...the lesser courts decided those cases! It seems useful to distinguish between electoral and district maps drawn with partisanship and those drawn to carry out dogma (aka extremely asymmetric map). The latter is rarely, if ever desirable in a democracy. Kudos to our judiciary branches (federal and state) who've demonstrated an ability to rein in our "out of control" legislative and executive branches on issues of fundamental significance to our ongoing experiment in democracy3. In a bit of Möbius loop irony the Chief Justice seems to imply that our democracy depends on biased and asymmetric redistricting maps! A decision by the Court that partisans must run their races on an unbiased and symmetric field is not mandating proportional representation. It's the Court simply saying when partisans run races they must race on the same field. One partisan cannot run the 100 yard dash on a circular inner ring while another runs the hurdles on an elliptical outer ring! CHIEF JUSTICE ROBERTS: No, but you're going to take this -- the whole point is you're taking these issues away from democracy and you're throwing them into the courts pursuant to, and it may be simply my educational background, but I can only describe as sociological gobbledygook. CHIEF JUSTICE ROBERTS: And if you need a convenient label for that approach, you can call it proportional representation, which has never been accepted as a political principle in the history of this country. CHIEF JUSTICE ROBERTS: That sounds exactly like proportional representation to me. "...all legitimate factors must be used in a way to favor party X or party Y,..."
"...BREDAR, Chief District Judge, concurring in the judgment: Partisan gerrymandering is noxious, a cancer on our democracy. See Vieth v. Jubelirer, 541 U.S. 267, 292 (2004) (plurality opinion) (concluding that severe partisan gerrymanders are incompatible with democratic principles); Ariz. State Legislature v. Ariz. Indep. Redistricting Comm’n, 135 S. Ct. 2652, 2677 (2015) (stating that to curb partisan gerrymandering is to restore “the core principle of republican government” that “voters should choose their representatives, not the other way around”) (quoting Mitchell N. Berman, Managing Gerrymandering, 83 Texas L. Rev. 781, 781 (2005)); Gill v. Whitford, 138 S. Ct. 1916, 1940–41 (2018) (Kagan, J., concurring) (“At its most extreme, [partisan gerrymandering] amounts to ‘rigging elections.’”)..."
Our Supreme Court must help our nation "up its game" by demonstrating a preference for concepts derived using science over those derived using wacky theology, fairy tales, a tooth fairy, Santa Claus, myths, or gobbledygook etc. UPDATED 01/11/2018 News&Observer, NC Congressional Districts Struck Down as Unconstitutional Partisan Gerrymanders and NYT, North Carolina Is Ordered To Redraw It Congressional Map and BrennanCenterLink2Opinion, League of Women Voters of North Carolina v. Rucho and Scribd, Common Cause Et Al v. Rucho Et Al and NYR, Will the Court Kill the Gerrymander? The President Pro Tempore of the North Carolina Senate seems unsure what to do next...how about doing exactly what the district court has ordered...produce fair district maps by January 29, 2018! "...No later than 5 p.m. on January 29, 2018, the State shall file with the Court any enacted proposed remedial plan, along with:..."
Significantly the court has ordered special masters for producing a remedial plan should North Carolina's Senator Philip E. Berger et al. be unable to do so. Why would anyone think a politician asserting a right to entrench "their party" to disadvantage others could fail to produce a fair district map? Or a politician that asserts a right to pick their voters obviating a voter's constitutional right to pick their politicians! Protection from racial gerrymandering gets equal protection and partisan gerrymandering gets speech/association protection—really? State's high court unpersuaded by arguments to stay the gerrymandering case League of Women Voters, et al. v. The Commonwealth of Pennsylvania, et al. - 261 M.D. 2017 while the Supreme Court decides Gill v Whitford; orders lower court to hear and rule on League of Women Voters et al. before end of the year. UPDATED 11/04/2017 FiveThirtyEight, The Supreme Court Is Allergic To Math and SciFri, Does Math Have A Place In The Courtroom? Understanding all possible district maps is an ongoing dynamic process mostly related to available computational power, which need not limit mandating fair maps today and fairer maps tomorrow! UPDATED 10/14/2017 NYMag, Will Justice Kennedy Sink Partisan Gerrymandering — or Save It? It seem brazen, at best for partisan proponents of extreme gerrymandering to argue that state legislatures have need unconstrained power to engineer extreme partisan redistricting maps they publicly pretend are the result of chance. MS. MURPHY: Mr. Chief Justice, and may it please the Court: Plaintiffs have not identified a workable standard for determining when the inherently political task of districting becomes too political for the constitution to tolerate. Indeed, the only thing plaintiffs have added to the mix since LULAC is a wasted votes test that identifies court-drawn maps as enduring partisan gerrymanders and conveniently favors their own political party. JUSTICE KENNEDY: You've probably considered the hypo many times. Suppose a state constitution or state statute says all districts shall be designed as closely as possible to conform with traditional principles, but the overriding concern is to increase -- have a maximum number of votes for party X or party Y. What result? JUSTICE GINSBURG: I don't think -- I don't think that was the question. It was it satisfies all the traditional criteria, contiguous, but it was a deliberate attempt to maximize a number of seats that Republicans would hold. JUSTICE KENNEDY: This is mandated by the state constitution. MS. MURPHY: I don't think that in a world where the legislature is required to and is, in fact, complying with a number of other metrics and is as one of those things taking into account partisan advantage, that you've proven a constitutional violation. JUSTICE ALITO: That's not a -- that's not a manageable standard. It's not a manageable standard that you cannot have a law that says draw maps to favor one party or the other. JUSTICE ALITO: That seems like a perfectly manageable standard. JUSTICE ALITO: You cannot have that. MS. MURPHY: -- the face of the statute, I think you have a different scenario because at least at that point, you know the intent. You know there's no debate to have about the intent of what the legislature is doing and if they are intentionally drawing for one purpose or another. JUSTICE KAGAN: But there are plenty areas of law, Ms. Murphy, where we look at intent beyond the face of a statute. And, you know, sometimes that's harder than other times. We understand it can be difficult. We understand in other cases it can be easy. But we do it all over the place in our law. We don't -- we don't say, oh, if it's not on the face of the statute, we're never going to look at it. So if your answer to Justice Alito is well on the face of the statute, that's certainly a manageable standard, I guess I would ask why not if it's not on the face of the statute? But you absolutely -- you know, but you have good evidence that there was the intent here, and you have good evidence that the intent led to a certain kind of effect, which was to entrench a party in power. MS. MURPHY: I think what differentiates this from a lot of other contexts is that here we have opinion after opinion from this Court, dissenting opinions, concurring opinions, plurality opinions, what have you, saying that considering politics in districting is not in and of itself inherently unconstitutional. MS. MURPHY: So just finding the intent isn't a problem. JUSTICE GORSUCH: I'd like to go back to Justice Breyer's question, and it would be helpful to get an answer for me on that. What criteria would a state need to know in order to avoid having every district and every case and every election subject to litigation? Because the -- the standard that's given in -- in the lower court here was, well, a little bit of partisan symmetry problem, a little bit of an efficiency gap problem, not a real set of criteria. And here, you know, is it 7 percent, how durable, how many elections would we need? How much data would we have to gather? Walk us through Justice Breyer's question and provide some answers, if you -- if you would. MS. MURPHY: Sure. So I think some of the problems with the criteria that have been suggested, in particular with the test that's focus on these symmetry metrics, is that so far the metrics that we have, I mean, they identify false positives roughly 50 percent of the time. And I don't know how a legislature is supposed to comply with criteria that can't differentiate between a court-drawn map and a map drawn for partisan advantage. So, when you start with the partisan symmetry concept, you automatically have the basic problem that you have to have some way to decide what is the appropriate partisan asymmetry. JUSTICE GORSUCH: Okay. But what are the questions -- you know, I need two years or two cycles worth of data. I need an S curve of a certain shape and size. I need an efficiency gap of something. What are the numbers, what are the criteria we'd have to fill in as a constitutional matter in order for a state to be able to administer this? † The author conducts sponsored conferences and workshops for Tufts, Metric Geometry and Gerrymandering Group, Geometry of Redistricting Summer School. It's unclear why the author would want to ever return to partisan gerrymandering once having left it? Partisan politicians capable of understanding, representing, and responding to a diverse cross-section of residents in our states is exactly what the nation is lacking and so desperately needs! Our Supreme Court routinely does optimization problems with multiple constraints. Reducing partisan gerrymandering is a path of no return our Supreme Court and nation should not just happily travel, but sprint down! Imagine our nation with a Supreme Court that is diffident, concerned, or anxious about constraining "raw assertions" of Machiavellian-like political power by our politicians or worse becomes a partisan in such assertions? It's highly likely that Chief Justice John Marshall did not have in mind a manageability standard or plan to handle the hoped for centuries of litigation that would follow his Supreme Court decision in Marbury v Madison! 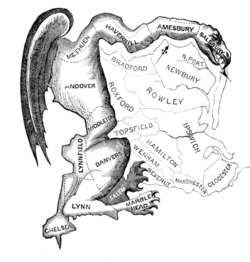 UPDATED 09/28/2017 AmerProspect, Slaying the Partisan Gerrymander and Governing, Will the U.S. Supreme Court Take a Stand Against Partisan Gerrymandering? It's not clear how an unbiased symmetric redistricting map threatens, even infinitesimally, any legitimate state interest? Our Constitution's 10 Amendment does not stand for the proposition that a state has a protected interest to do whatever its politicians can dream up and that special interest will fund†! † Special interests view these "partisan-protected-seats" as a beneficial investments. Economists view them as harmful and inefficient rent-seeking, which in the case of redistricting can last 10 or more years! Our citizenry view them as unresponsive corruption, which harms our democracy. How will the justices on our United States Supreme Court view them from their "partisan-appointed-protected-seats"? An interesting question, which the justices will not directly decide is: can a "partisan-appointed-protected-seat" turn into a "partisan-protected-seat"? If yes, how can that transformation be quantified and its chance reduced? Should it? Generating a very large population of random unbiased redistricting maps seems extraordinarily useful, with applications far beyond providing judges with a simple and accurate method for judging a proposed redistricting map's fairness (i.e. skewness or asymmetry). Hopefully, it's receiving the necessary funding and super computing (Blue Waters) time (processing nodes)? At least Pennsylvania's creative politicians used a seafood and steak house (Creeds) instead of the usual boring old uninhabited interstate highway to make sure the district is contiguous! UPDATED 07/10/2017 BostonGlobe, It’s unfair and Unjust. 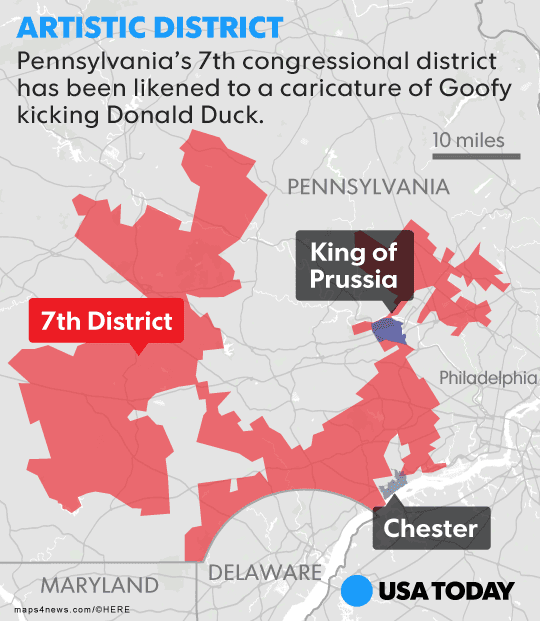 So Why Has Gerrymandering Lasted This Long? Isn't gerrymandering just one of many methods used to manipulate election outcomes in modern democracies? UPDATED 06/03/2018 PGP, The Princeton Gerrymandering Project Is Expanding! A formal redistricting framework must make sure ALL maps drawn as part of the iterative redistricting process are systematically preserved and open for publicly perusal. If your dogma and extreme agenda requires you to win in a gerrymander district or to suppress voting and voters you might want to reconsider your dogma and extreme agenda or leave politics. If you're a "specialist" that helps politicians to gerrymander districts or suppress voting and voters get a new specialty. UPDATED 06/22/2017 SnagFilms, How Elections Are Rigged - "Gerrymandering"
UPDATED 06/20/2017 Priceonomics, Can an Algorithm Eliminate the Unfairness of Gerrymandering? 1. UPDATED 09/26/2017 Special interests invest enormous sums of money to corrupt our legislatures, which returns a value near zero if "their" patron politician leaves office. 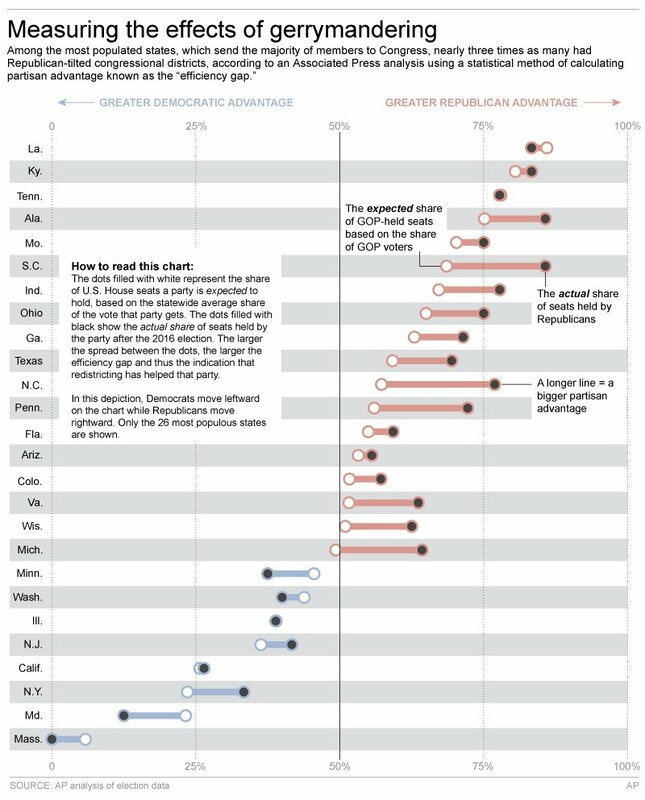 A positive return on investment is more likely if "their" politician remains in office—enter gerrymandering. Eliminating gerrymandering will decrease that chance and perhaps end the corrupting investments altogether? Unfortunately, our United States Supreme Court has historically eschewed these "messy political issues" tending to characterize corrupting special interest investments as speech. But, before stalemate and standoff turns into shooting and deadlocked democracy it may want to reconsider what's messier, deadlocked democracy or political questions. 2. A disobedient vassal is dissiesined from their "safe-seat" (fiefdom) when the overlords choose another perceived obedient vassal for a "primary challenge" against the disobedient vassal. Repossession and reconveyance of the "safe-seat" (fiefdom) by the overlords is known as "getting primaried". Using the electoral process to make sure an obedient vassal perpetually occupies a "safe-seat" transforms "one-person-one-vote into one-vassal-no-vote and undermines a "representative democracy". 3. Our nation's current schism is likely more dangerous and detrimental than extreme partisanship would imply? Think of Carl Schmitt's "friend-enemy" distinction.